Will add 1300 lbs of weight to the front end. Weight removal may be required. 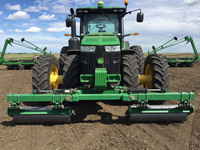 For 2015-2018 John Deere® 9RT Series Tractors, order the LANSRJD9RT15.